If I were a better blogger, I'd carry a camera around my neck at all times. Then maybe I could snap a picture of the red fox that I saw running through our backyard or the coyote loping across a field near our house or the black bear digging around in our neighbor's trash last spring. 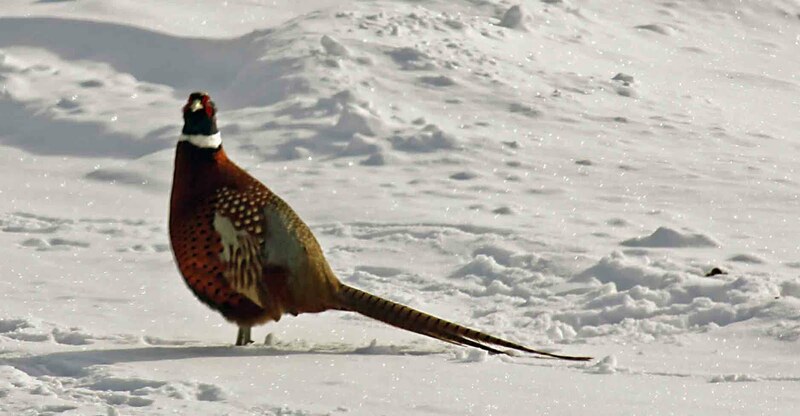 Lo and behold, I actually had my camera in the car the other day when I spied this wild pheasant in someone's yard. Too bad I don't know how to focus. Wow! But you know very well I'm really excited to see a moose too. The wildest animal I've seen lately was a gray squirrel. Lame! And half my pictures are blurry. You can just blame it on the camera like I do. oh my. what a sight. all that snow!! !